If I had the chance to modify the lyrics to The Sound of Music’s My Favorite Things, I’d be sure to list “finding random children’s animal rightsy books at the library” as one of them. I just recently scored this little literary nibble. 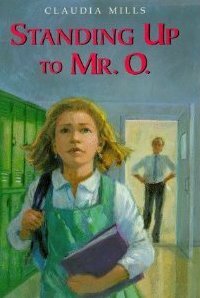 Claudia Mills’ Standing Up to Mr. O. is a great chapter book designed for late elementary and middle school-aged children written in first person by Maggie McIntosh, a well-rounded seventh-grader who adores her biology teacher, Mr. O’Neil. In a way, O’Neil has served as a parental figure in Maggie’s life since her dad bailed on the family eight years ago. But the close relationship with Mr. O is put in jeopardy when dissection comes up in the syllabus, not just with worms, but fish and frogs too. Maggie takes issue with the needless killing of life, but for O’Neil, Maggie’s discontent and protest undermines his 20+ years teaching the subject matter, and he holds that against her. One student in particular socks it to her as well, questioning her logic on eating animals. Such prodding incites sensible Maggie to adopt a vegan diet. (Later on in the text, her mom finds a “happy, family farm” so they do eat eggs and dairy.) She finds refuge and romance with the class bad boy Jake who also thinks dissection is immoral. Standing Up to Mr. O. has it all: a clandestine frog rescue, a friendship tried, tangled hearts, injustice fought, and the growing pains ever-present in a tween’s life. Ah, how sweet it is to be young! This book sounds great! I refused to dissect in high school, and it was one of the defining moments of my early life. It seems crazy to me that this is still required in many schools! I disagree that it’s sweet to be young–at this age I was bullied and very miserable. I also refused to dissect and caught hell for it. Looks like a good book.